A former chemical manufacturing plant in northwest Italy was due for demolition to allow redevelopment into residential properties. 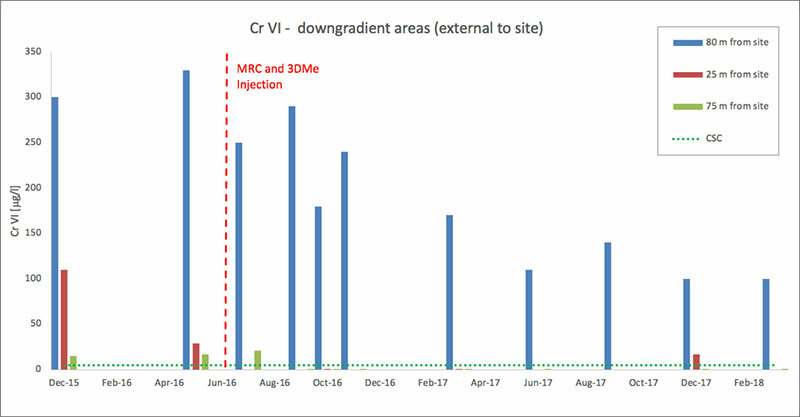 Site investigations showed elevated concentrations of Cr(VI) in the groundwater, which were above the stringent National Standards of 5μg/L, requiring remedial works to be completed. The groundwater under the site is aerobic and fast-flowing, causing the contaminant plume to migrate beyond the site boundary. It was decided that an in situ approach was required to remediate the Cr(VI) prior to sale of the site. Two areas within the plume were identified as being above the site remediation target of 100μg/L. These were targeted with an injection of 3D Microemulsion (3DMe) and MRC in order to reduce the soluble Cr(VI) to non-toxic solid Cr(III) and stabilise it within the aquifer matrix. The dose of MRC was tailored to match the vertical distribution of the contamination in order to provide the most accurate and cost effective treatment. 3DMe relies upon micellar transportation following injection in order to provide a wide radius of influence from each injection location. This was important on this deep site, in order to minimize the number of injection points required on the site. Fixed injection points were installed and a single application of the reagents was completed. The injectable substrates were combined at a central mixing location and then pumped into several injection points simultaneously. The process was repeated until the all of the target areas were treated. 3DMe provides an immediate, mid-range and long-term, controlled release supply of hydrogen (electron donor) to rapidly create and then sustain anaerobic conditions. This will reduce the Cr(VI) to Cr(III), which will then settle out as a solid. Reversion to natural conditions following the 3DMe treatment (in perhaps five years or more) will not cause this process to reverse. 3DMe is also designed to distribute over very wide areas from each injection point. This is achieved through the molecule having hydrophilic and oliophilic properties hence upon mixing with water, 3DMe forms a microemulsion made of tiny micelles, which propagate through and coat the aquifer. This micelles are also able to transport MRC molecules within them, creating a wide and effective treatment zone, which is then sustained for many years. 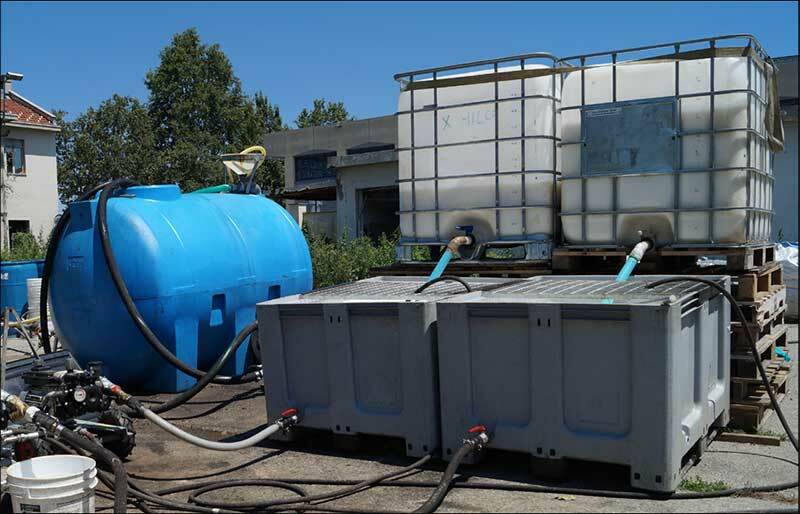 MRC is a controlled release remediation product designed specifically for the treatment of hexavalent chromium (Cr(VI)) in groundwater. MRC’s active compound is an ester of cysteine (a sulfur-containing amino acid) on a carbon backbone molecule of glycerol and sorbitol. A cysteine-based product such as MRC is well suited for in situ Cr(VI) immobilisation, since it has a strong affinity for metal contaminants and does not alter the properties of the subsurface. The active compound in MRC (sorbitol hexacysteinate) is embedded in a polylactate matrix that provides a carbon source and electron donor for subsurface bacteria. This combination of materials makes MRC a viscous but injectable material that slowly releases the cysteine ester to a contaminated aquifer via hydrolysis by water or enzymatic action by microbes. MRC’s slow release property allows for a longevity of 12 to 18 months in an aquifer, allowing for an effective approach to metals immobilisation. Chromium VI concentrations in groundwater before and after treatment. Validation monitoring shows very good substrate distribution at all but one out of thirteen monitoring points. The reduction of the Oxidation- Reduction Potential (ORP) and dissolved oxygen with the simultaneous increase of the Total Organic Carbon (TOC), as well as an increase in iron and manganese, clearly showed the desired trend. The analytical results showed a rapid and significant reduction of CrVI targeting values often below the 5 μg/l limit, with a removal efficiency of 90% on average. The ability of 3DMe to self-distribute over a wide radius of influence from each injection point allowed the injection grid to be widely spaced. This minimised the number of application wells, which, given the depth of the treatment, greatly reduced the remedial costs. Treatment of Cr(VI) was very rapid and sustained despite the aquifer being very aerobic and fast flowing. Even though the aquifer was very fast-flowing, the products have not suffered from wash-out and continue to successfully treat the target areas over an extended period of time. The seasonal variation in groundwater level at the site has the potential to mobilise contaminants into the groundwater during periods of high precipitation. The longevity of the reagents allows this contaminant influx to be addressed and avoid rebound. The injection technology selected saved money by avoiding the use of clustered-wells. The injection rate was high, saving time on site. The results of the remediation can be seen over 20m downgradient, through a significant reduction of Cr(VI) in offsite monitoring wells, providing rapid benefit to the environment on and off the site.